In the concluding chapter of the book under review author Andrew Blum visits Google’s data centre in Oregon in the US, where he gets a cold reception. Google employees refuse to show him around little more than the lunchroom. “The company’s primary colors and childlike playfulness no longer seemed friendly... They made me feel like a schoolkid. 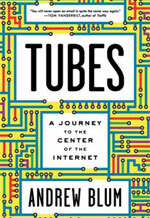 This was the company that arguably knows the most about us, but it was being the most secretive about itself,” Blum writes in Tubes, A Journey to the Center of the Internet. For all their significance to modern day life, the physical paraphernalia that make up the Internet are dull objects: bundles of cables; deserted stations ringed in cyclone fencing beside lonely highways; featureless, windowless buildings in old warehouse districts and, above all, rooms filled with metal boxes, blinking lights and cool, dry processed air. Blum had not given the nuts and bolts of the Internet much thought until a squirrel chewed through the wires at his apartment snapping off the Wi-Fi. I was baffled a few years back to learn a septuagenarian Georgian had cut most of Armenia off from the Internet when her spade went through a vital cable. It had taken five hours to restore connectivity. It was astonishing to find one of the most sophisticated accoutrements of our times at the mercy of a mundane foible. After reading Blum’s Tubes, I realise how possible such accidents are.